Thailand’s northernmost province, Chiang Rai, is often unfairly compared to the tremendously popular tourism destination of Chiang Mai. Many visitors to the kingdom have the idea that Chiang Rai is simply a smaller version of Chiang Mai and will not venture any further north. However, the city of Chiang Rai, the provincial capital, has its fair share of interesting sights and is the gateway to the scenic hill country of Thailand’s northern frontier. It is also a convenient stop on two common overland travelers’ routes; Myanmar via the Mai Sai border crossing point and Laos via Chiang Khong. Once known for opium poppies, heroin production, warlords and CIA intrigue; the province is now one of the country’s top tea and coffee producing regions. 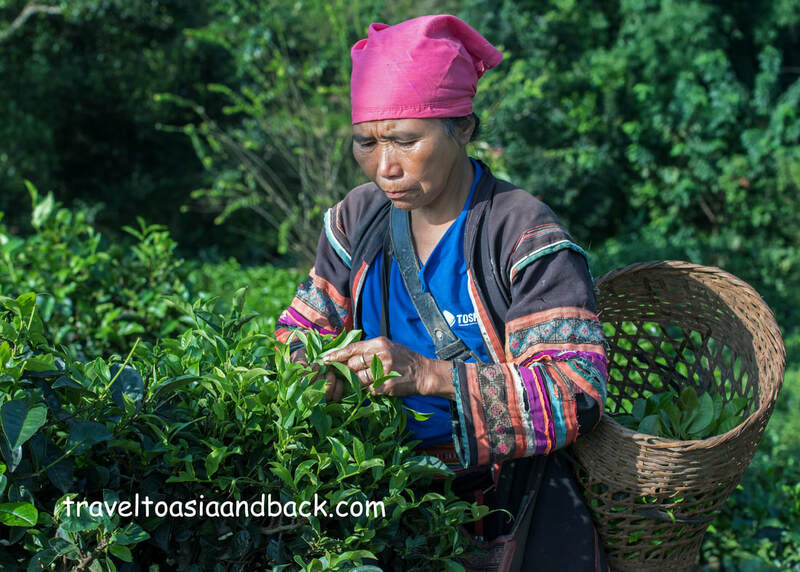 Thai tourists make weekend road trips to this beautiful area to sample and purchase tea and handicrafts made by artisans from the many ethnic minority groups that inhabit the region. There is little doubt that the majority of western travelers who journey to Thailand’s mountainous north do so specifically to enjoy the region’s breathtaking scenery. Although it’s possible to view the lush green tea-covered hills and valleys from the comfort of a car, trekking gives one an opportunity to get off the main road and really experience this beautiful country and meet its charming inhabitants. Trekking is also great exercise and, if only for a little while, reduces our carbon footprints. Single and multi-day trekking tours can be organized through one of the many travel agencies located in Chiang Rai City. 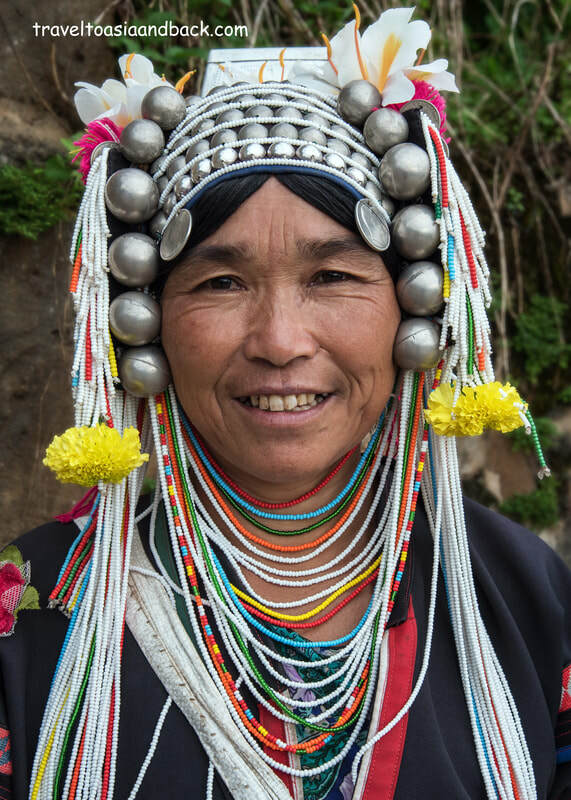 Tours generally include visits to villages inhabited by Akha and Lahu and Karen hill people. 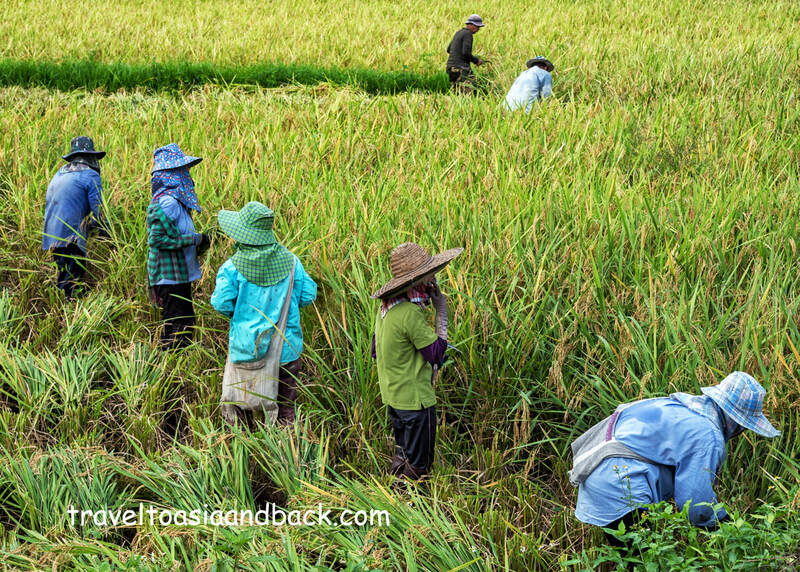 In addition to touring the countryside, there are a number of things to do and see in and around the city of Chiang Rai. Within walking distance of the city’s tourism hub are a few beautiful Buddhist temples, or Wats, as they are better known in Thailand. A favorite of Thai tourists is Wat Phra Kaeo (Temple of the Emerald Buddha). The famous emerald Buddha image now housed in the Grand Palace in Bangkok was originally found at this site in 1434. 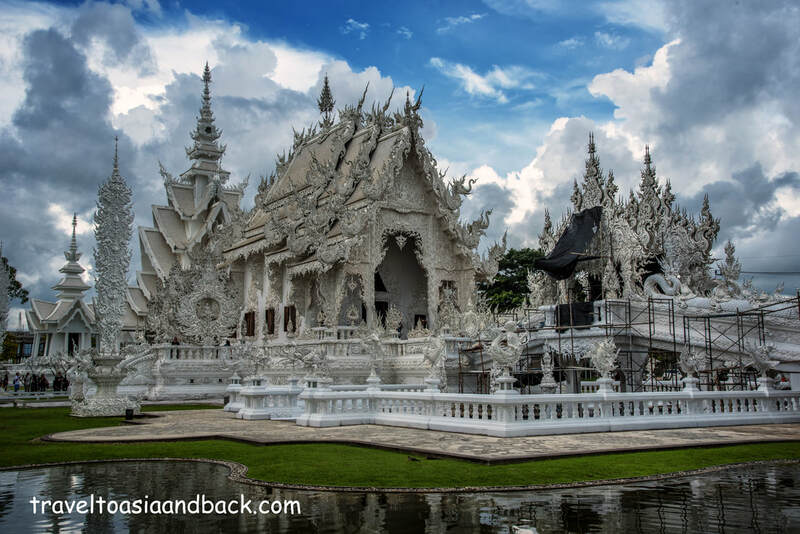 Wat Rong Khun or the White Temple, is the vision of Chalermchai Kositpipat one of the kingdom’s best known artists. An accomplished painter and sculptor, the artist combines traditional Buddhist art with images chosen from current world events. Although construction of the temple began in 1997, Kositpipat and his team of artisans see this as a never-ending project and will continue adding to the site indefinitely. The Baan Dam Black House Museum, or the Black House for short, was the artistic vision of another prominent Thai artist, the late Thawan Duchanee. The site is not actually one building as the name suggests, but is made up of a number of traditional Thai style teak homes and unique modernist structures that seem quite out of place. Many of the artist’s works are made from natural materials such as buffalo skulls, horns and crocodile skins. The overall visual effect is very interesting. Tourists who are not interested in trekking can easily find tours of the province which include visits to hill tribe villages, tea plantations, the White Temple and the Golden Triangle. ​Chiang Rai is the transportation hub of the far north and is easily accessible by bus from Chiang Mai and by plane from several cities in Thailand, Hong Kong and mainland China. Located ten kilometers from the city center, Chiang Rai International Airport (CEI) receives daily flights from Bangkok, Phuket, Hat Yai, Hong Kong and the Chinese cities of Kunming and Haikou. One popular travelers’ route through northern Thailand begins with a flight from Bangkok into Chiang Rai. The flight takes just over one hour and can be booked with discount carriers such as Air Asia, Nok Air and as well as Thai Smile or the more expensive Bangkok Airways. From Chiang Rai visitors will make the three-hour bus trip to Chiang Mai and continue working their way south by bus, train or a combination of the two. As Thailand’s Northern train line ends in Chiang Mai, many budget travelers and backpackers travel to Chiang Rai by bus. Bus travel in Thailand is safe, easy, reasonably comfortable and inexpensive. Numerous buses depart daily for Chiang Rai from Chiang Mai’s Arcade Bus Station. Ticket prices vary depending on which bus and company is chosen but the price for the three-hour trip generally costs from 140 to 280 THB. Long distance bus travel is also possible between Chiang Rai and Bangkok’s Northern Bus Terminal (Mo Chit) as well as the cities of Ubon Ratchathani, Chonburi, Pattaya and Rayong. Chiang Rai is the overland travel gateway to Myanmar via the Mae Sai / Tachileik border crossing points. Travelers can also easily reach the Thai city of Chiang Khong and cross the border into Laos via the Chiang Khong-Huay Xai Friendship Bridge. ​Known locally as Doi Mae Salong, this small town is nestled in between lush tea-covered hills in an area once infamous for opium cultivation. It is a popular weekend getaway destination for Thai tourists looking to escape from the hustle and bustle of Chiang Mai. 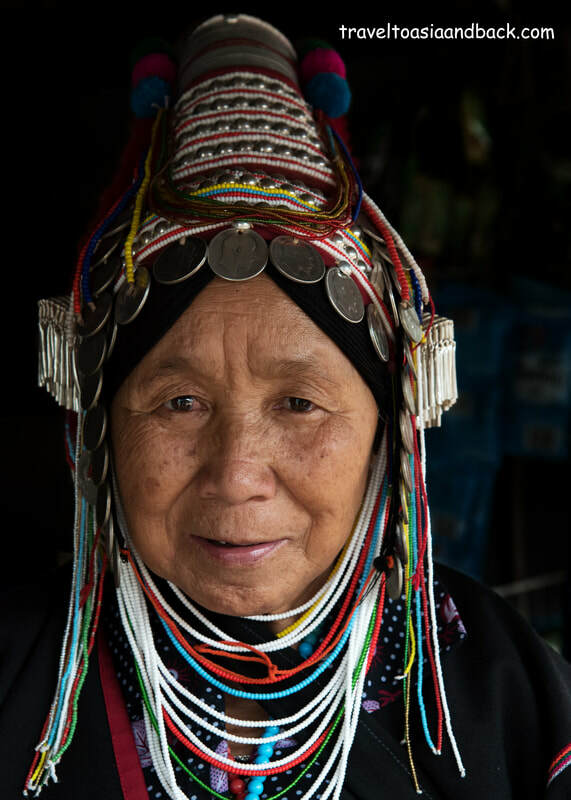 Settled by remnants of China’s defeated Kuomintang (KMT), or the Army of the Republic of China, the town offers visitors an interesting mix of Thai, Chinese and hill tribe culture. Although the impressive Wat Santikhiri, a Thai Buddhist temple, seems to watch over the town from its hilltop perch, much of the town’s architectural style is more Chinese than Thai. Many of the locals speak Mandarin and “fresh Yunnan noodles” appear on virtually every menu. Wander just off the main road and you will find yourself in farming villages settled by Akha, Lisu and Lahu people. Early each morning the hill people gather in the town center were they sell the meat and produce at a small but very traditional wet market. The trading begins at 06:00 and is mostly over by 08:00 when villagers head off to work in the fields. 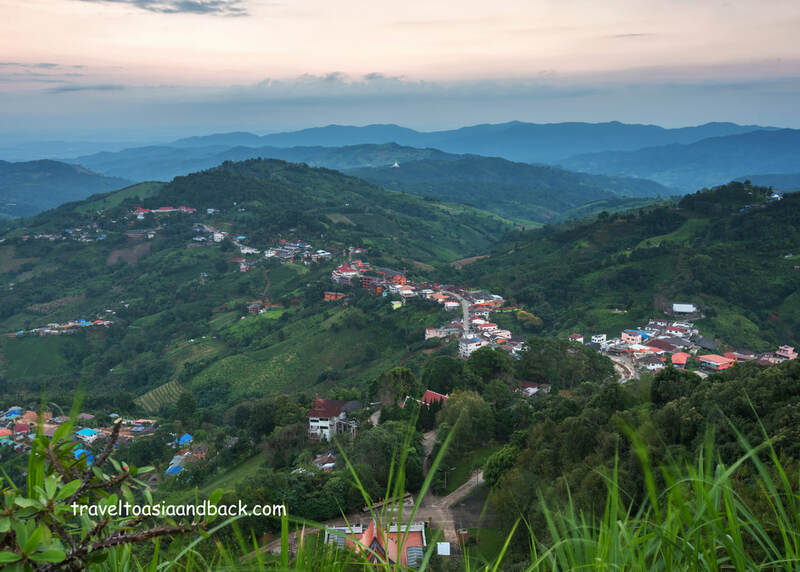 While the area has a few sights to see like the Martyr's Memorial Hall, a museum dedicated to the former KMT soldiers who fought against Thai communists during their 18 year insurgency, Doi Mae Salong’s primary attraction is its beautiful scenery. Armed with Google Maps and the simple paper maps provided by guest houses, visitors can spend hours trekking through the area’s lush green hills. 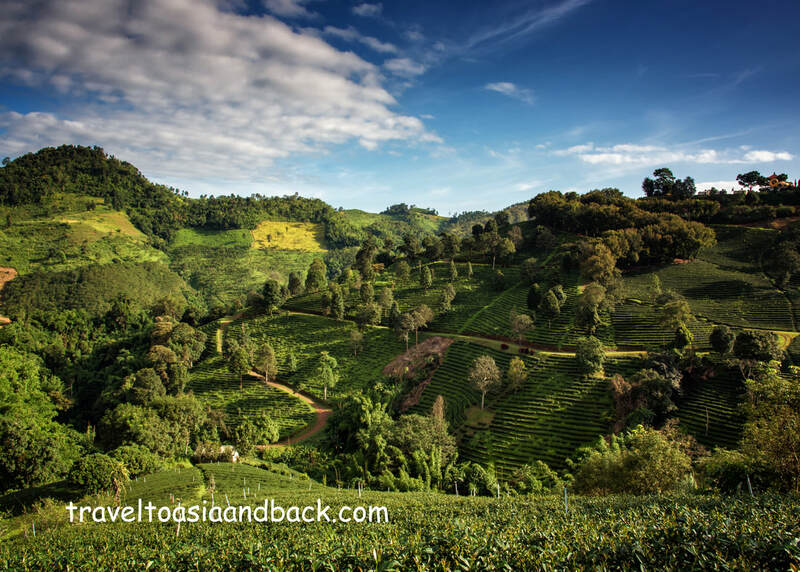 Hiking trails, typically narrow roads or paths that connect villages to farmer’s fields and tea plantations will lead trekkers through a number of hill tribe villages. Many of these villages appear to see few foreign visitors. For our part we found Mae Salong to be the best place in the province to meet and photograph the friendly and colorfully dressed Akha women. 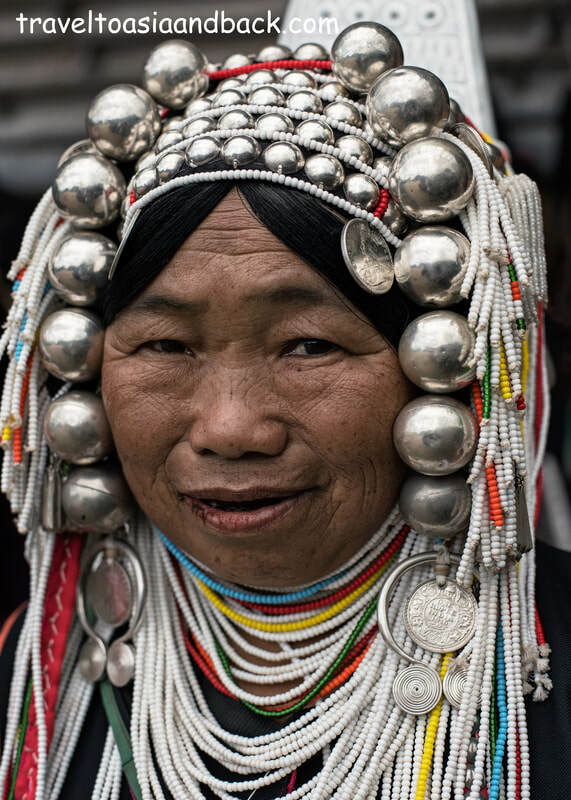 Yes, many of the old gals are full-time trinket vendors and it’s easy to dismiss the town’s souvenir stands as touristy, but the hill people of Southeast Asia have a long tradition of hand making clothes, bags and jewelry. As more ethnic people choose to buy and wear western clothing travelers have less opportunity to see authentic traditional costume. A chance to interact and photograph these lovely people is well worth the price of a few inexpensive handicrafts. Located approximately 60 kilometers from Chiang Rai city, Mae Salong can be reached by two different winding and very scenic country roads. Highways 1130 and 1089 run west from Highway 1 in Mae Chan and if traveling by car or motorcycle both roads can be utilized to make a loop through the area’s hills and mountains. The journey by car takes roughly one hour and thirty minutes. Budget travelers can take one of the many public buses that run up and down Highway 1 between Chiang Rai and Mae Sai to the junction of Highway 1089 in Mae Chan. From Mae Chan passenger-carrying pick-up trucks, or songthaews, must be utilized to complete the remaining 34 kilometers of the journey. A one-way trip on these green-colored songthaews costs 60 THB. ​Although the term Golden Triangle originally referred to the 135,000 square mile (350,000 km²) opium growing region of Thailand, Laos and Myanmar, to today’s visitors it means the tiny town of Sop Ruak (Sob Ruak). 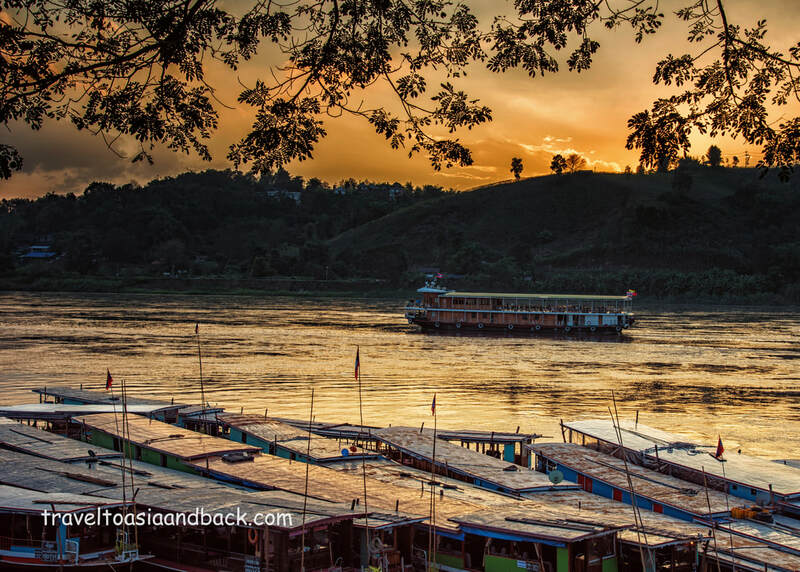 A standard stop on any bus tour through the province, the town center consists of a scenic viewpoint overlooking the Mekong and Ruak Rivers, which serve as natural borders, separating the three nations. Alongside the river bank is an enormous Buddha image, several shrines and various triangular-shaped signs and markers that are popular with selfie-stick wielding tourists. The sidewalk across the street is occupied by a long row of souvenir stands, all selling the same products. It would be very easy to dismiss Sop Ruak as a tourist trap if it were not for the fantastic Hall of Opium. The Hall of Opium, not to be confused with the House of Opium Museum, is a fantastic museum which features numerous displays and audio visual presentations which describe the history of opium cultivation, trading, medical use and abuse. The professionally designed exhibits and displays feature signage in both Thai and English. History buffs will really enjoy this museum and as there is a lot to see; plan on spending two to three hours here. The Golden Triangle is often included on day tours originating from Chiang Rai City. There are at least a dozen, probably many more, travel agencies scattered around Chiang Rai’s tourism hub. Most guest houses and hotels also offer or organize a variety of sightseeing and trekking tours. A typical day tour will often include stops at the White Temple, Black House, an ethnic village or two and on to the Golden Triangle and the Hall of Opium. The roads in this part of Thailand are very good. The town can be easily reached by Highway 1290 from either Mae Sai or Chiang Khong. Budget travelers can utilize songthaews which depart regularly from Mae Sai; the 45 minute trip costs approximately 50 THB. Mae Sai is Thailand’s northernmost city and gateway to Myanmar via the Mae Sai / Tachileik border crossing point. A bustling trading town, it is best known for the huge covered market which sprawls along the Thai side of the Ruak River, the natural dividing line between the two nations. From Chiang Rai Highway 1 travels northward into and through Mae Sai ending at the border with Myanmar. The highway is essentially Mae Sai’s main thoroughfare and makes reaching the town quite easy. Buses regularly depart Chiang Rai for Mai Sai; the ninety-minute trip costs 40 THB. Mae Sai’s bus station is located approximately 5 kilometers south of the border crossing point. Red-colored songthaews are available at the bus station to complete the journey for 15 THB. This busy border check point is open daily from 06:30 AM until 09:00 PM. 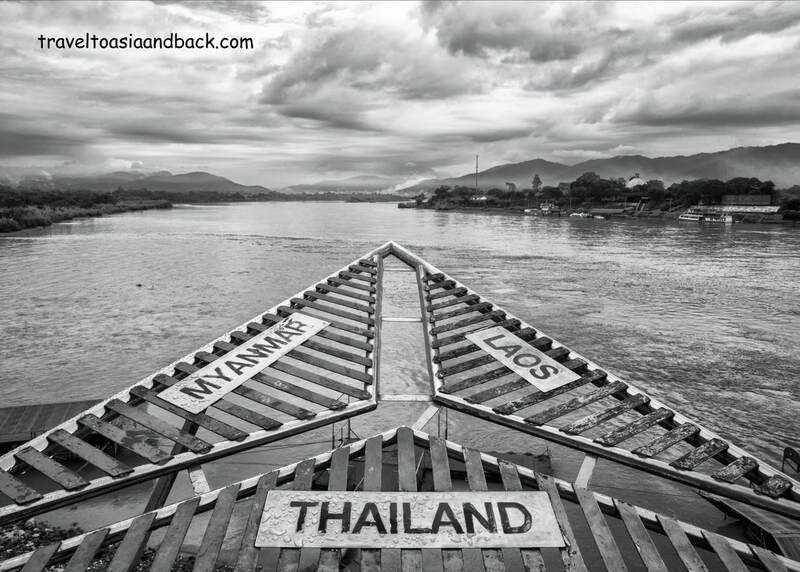 Clearing out of Thailand and into Myanmar is quick and easy but to enter and travel in Myanmar you will need either a tourist visa issued from an embassy or consulate or an e-visa issued from the official government website. It is also theoretically possible to make a day trip across the border, for shopping or sightseeing, and return to Thailand. In the past, visitors would leave their passports with the Thai police and pay a fee, around 600 THB, to spend the day in Myanmar. However, Thai officials have recently began cracking down on “visa-runners”, people who cross the border specifically to return to the Kingdom on the same day and receive a new visa exemption stamp in their passports. We have first hand information (Sep 2017) about travelers who were told that if they crossed into Myanmar they would not be allowed to return to Thailand. Thai officials are notorious for frequently changing immigration rules and regulations; day trippers and visa runners are advised to verify the current situation before arriving at the border. 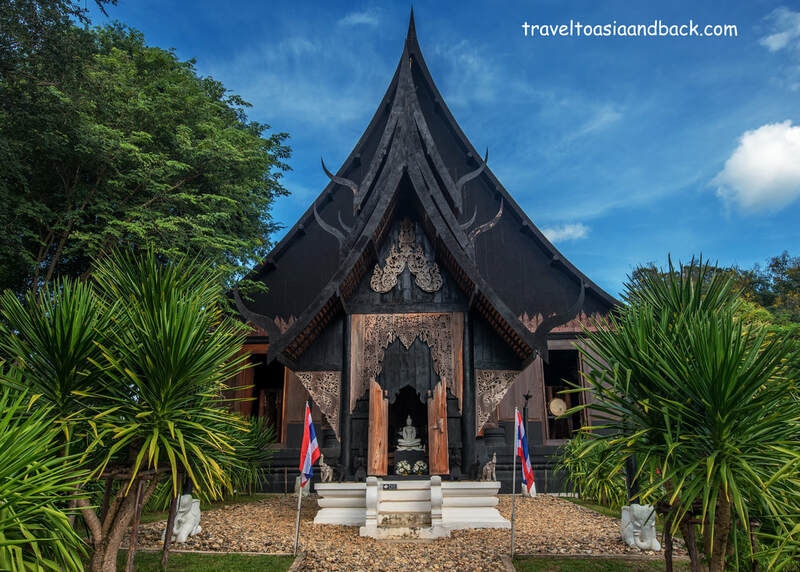 ​Located on the border of Laos, 105 kilometers northeast of Chiang Rai city, Chiang Khong is a common stopping point on the well-traveled northern overland route between Thailand and Huay Xai, Bokeo Province, Laos. This tourist-friendly small town has a number of hostels, guest houses, budget hotels, bars and restaurants that cater to western travelers. Situated alongside Highway 1020 at the junction of Highway 1290, Chiang Khong can be easily reached from Chiang Mai, Chiang Rai or Mae Sai by car or motorcycle. Local buses run between Chiang Rai and Chiang Khong throughout the day. A one-way trip on these red-colored buses takes roughly two hours and costs 60 THB. Greenbus, a well-known Thai bus company, runs three daily buses between Chiang Mai Chiang Khong. The five-hour trip costs 200 THB. Buses are also available to Bangkok and other major cities in northern Thailand and Issan.